Daily Mandatory Charge will be added to the room rate and includes 1.25PCT S.A. T.P.I.D. 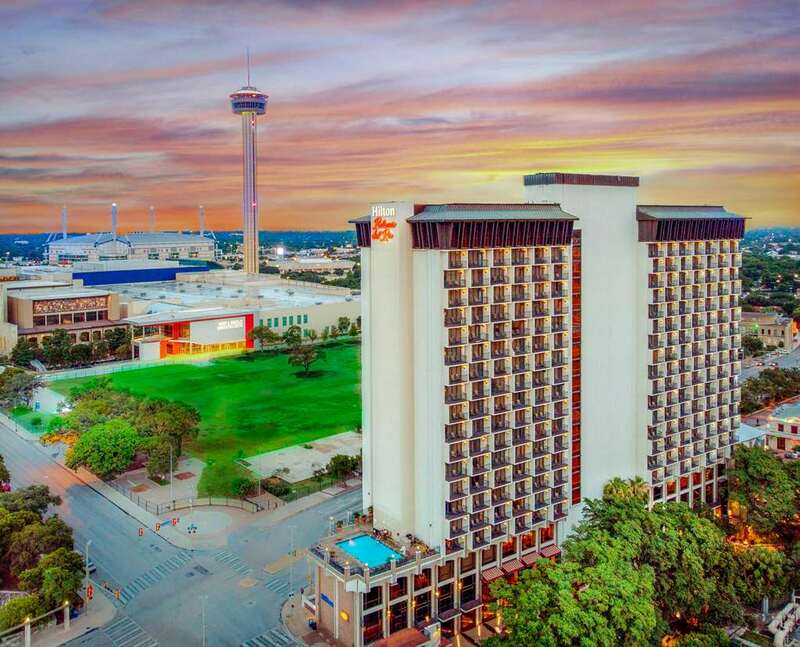 Fee If the River Walk is your primary destination Hilton Palacio del Rio is the place to stay. Every room in our 4-Diamond hacienda-style hotel has a balcony overlooking the River Walk or the city. In walking distance from restaurants bars and shops we*re across the street from the Henry B. Gonzalez Convention Center and boast 25 meeting rooms for events. Check out River*s Edge Cafe Patio Bar Tex*s Sports Bar /the only sports bar on the River Walk/ and the famous Durty Nelly*s Irish Pub. We also offer Starbucks in our lobby-level Coffee Cupboard. Rincon Alegre Lobby Bar: Lobby lounge. The perfect setting for the end of the day. Overlooking the Riverwalk. Tex*s Riverwalk Sports Bar: From NASCAR to Football Tex*s Sports Bar has it all. Relax and enjoy the only Sports Bar on the River Walk. Coffee Cupboard: We proudly serve Starbucks coffee. Brighten your day with fresh coffee specialty drinks breakfast on the go and a variety of snacks pantry and convenience items. Durty Nelly*s Irish Pub: Irish Pub. World famous Durty Nelly*s is one of a kind. Features nightly sing-a-longs and all you can eat peanuts. Great snacks.